The Ancient Order of Hibernians in America is the oldest and largest Irish fraternal rganization in the United States. It is also the oldest lay Catholic ethnic organization in the U.S. The AOH can trace its roots back to a series of similar organizations that existed in Ireland for more than 300 years. The AOH aids newly-arrived Irish immigrants, both socially and economically; assists efforts leading to the re-unification of Ireland; serves as a bridge between Irish Americans and their ancestral homeland; fosters Irish culture; and supports the Church and its mission, especially in charitable works. In all its efforts, the AOH labors in the spirit of its motto: Faith, Unity, and Christian Charity. The Ancient Order of Hibernians is a country-wide organization which embraces both our Irish Catholic heritage and our American citizenship. There is a national organization, led by a national President and Board of Officers. There is a similar organization on the State level. Finally, there is the organization on the local level, the Divisions. We are Massachusetts Division 36 of the Ancient Order of Hibernians in America. 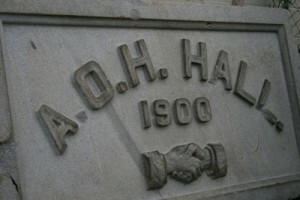 The website of the national organization is www.aoh.com. The LAOH of today is an independent organization, completely separate from the AOH. However, the two groups work very closely and amicably together in a variety of ways. It is not uncommon that a husband is in the AOH and his wife is in the LAOH. An interesting difference in membership requirements is that a woman need not be Irish or of Irish descent to join the LAOH if her husband is Irish or of Irish descent. The website of the LAOH national organization is www.ladiesaoh.com.